Bonny Susan Hicks (5 January 1968 – 19 December 1997) was a Singapore Eurasian model who gained her greatest notoriety for her contributions to Singaporean post-colonial literature and the anthropic philosophy conveyed in her works. Her first book, Excuse Me, are you a Model?, is recognized as a significant milestone in the literary and cultural history of Singapore. She followed it with Discuss Disgust and many shorter pieces in press outlets, including a short-lived opinion column that was pulled amid public criticism from Singaporean traditionalists. Hicks died at age twenty-nine on 19 December 1997 when SilkAir Flight 185 crashed into the Musi River on the Indonesian island of Sumatra, killing all one-hundred-and-four aboard. After her death numerous publications, including the book Heaven Can Wait: Conversations with Bonny Hicks by Tal Ben-Shahar, featured her life and thought. Although Hicks was widely deemed controversial during her lifetime for her willingness to openly discuss human sexuality, her legacy is understood as important for particularly Singaporean society during its period of broad-scale societal changes under forces of globalization. She is deemed an important transitional figure between old and new Singapore. 3.1 Excuse Me, Are You a Model? 3.3 "The Bonny Hicks Diary"
Hicks was born in 1968 in Kuala Lumpur, Malaysia, to a British father, Ron Hicks, and a Cantonese-speaking Singaporean-Chinese mother, Betty Soh. Hicks' parents separated soon after her birth and Soh relocated to Singapore in 1969 with her infant daughter. There, Hicks' formative social environment was multi-ethnic and multi-lingual, and included Malays, Indians and Chinese of various dialect groups. Although she was multiracial, she identified as Chinese during her early childhood, speaking Cantonese and watching Chinese-language television at home. When Hicks was twelve, her mother accepted a job as a caretaker of a bungalow in Sentosa, Singapore, and they relocated to the island away from a Singaporean Housing and Development Board flat in Toa Payoh. Throughout her teens, Hicks lived with her mother on Sentosa Island, and intermittently with her porpor (grandmother) with whom she enjoyed a particularly close relationship. Hicks never met her father. At aged sixteen, she successfully traced him through the British High Commission, with whom he was stationed on Singapore during Hicks' conception. Married with children from the arrangement, and likely keeping his past muffled from his new family, he returned word via fax to Hicks that he wanted nothing to do with her. Despite Hicks' joking whenever publicly questioned about it, her father's rejection remained painful to Hicks throughout her life. Hicks in 1987, on the magazine cover that launched her modeling career. 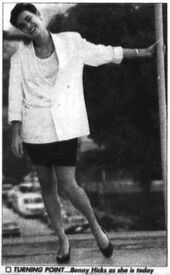 After completing her A levels through the Hwa Chong Junior College, Hicks was "discovered" at age nineteen by Patricia Chan Li-Yin ("Pat Chan"), a nationally decorated female swimmer who retired to later become a magazine editor and talent agent. Hicks and Chan enjoyed an especially close relationship that was certainly multi-leveled, a complicated mix of the professional and personal, the sisterly and motherly, and as some thought, perhaps more. Stemming from ambiguous statements Hicks later made in her first book (e.g., "I was in love with Pat Chan"), Singaporeans widely speculated over whether the two were homosexually involved. While Hicks' statements in her book could be interpreted as stemming from only an intimate mentoring relationship with Chan, whom Hicks clearly idealized with high admiration, Hicks continued to be ambiguous on the matter whenever questioned, if only to fuel a sense of mystery about herself, and thus ongoing buzz and publicity. Hicks' modeling career began with the September 1987 cover of a popular Singaporean fashion monthly, GO. She followed it with scores of other covers, upwards of thousands of print advertisements, routine catwalk appearances in designer clothes, and a music video debut on a local top-10 hit by the Singaporean band The Oddfellows. Just a year into her modeling career, Hicks began writing about her life experiences and ideas surrounding her modeling, and by age twenty-one, had completed her first book, Excuse Me, are you a Model? She continued to model for five years until aged twenty-four when, coinciding with the 1992 release of her second book, Discuss Disgust, she abruptly left modeling to take a job as a department lead and copywriter in Jakarta, Indonesia. At that time, Hicks clearly stated what she had only hinted at before: that she never wanted to be a model in the first place. Instead, her dream since age thirteen was to be a writer. It was at that age that she began keeping a diary of her feelings and experiences, probably initially as a school assignment, a practice she frequented throughout life. Before her move to Indonesia, Hicks was briefly married to a former member of the Republic of Singapore Air Force. Hicks left him for Richard "Randy" Dalrymple, an American architect, by whose side she died. Hick's former husband was a former colleague of the pilot of the plane in which Hicks perished. This connection would later become a troubling focus of the investigation into the airline crash that took Hicks' life. Excuse Me, Are You a Model? Re-print edition of Excuse Me, Are You a Model? Photo of Hicks on the back cover of Excuse Me, Are You a Model? Hicks published her first work, Excuse Me, Are You a Model?, in Singapore in 1990. The book is Hicks' autobiographical exposé of the modeling and fashion world and contains frequent candid discussion from Hicks about her sexuality, a subject not traditionally broached in Singaporean society. The work stirred significant controversy among Singaporeans who held traditional literary and moral standards, who considered it a "kiss and tell" book and "too much too soon" from a quintessential independent woman barely into her twenties. Singaporean youth, on the other hand, had a starkly different view. In just three days they bought up twelve thousand copies, and after two weeks, twenty thousand copies, prompting the book's publisher to boast Hicks' work as "the biggest book sensation in the annals of Singapore publishing." In point of fact, the publisher was not exaggerating. During the years leading up to Hicks' death, Singaporean English literature scholars had begun to recognize more than just a simple generational divide in the reactions to Hicks' book, and were describing it as "an important work" in the confessional mode of the genre of post-colonial literature, and "a significant milestone in Singapore’s literary and cultural history." By then, Singaporean young people had already established a localized literary movement, following Hicks' lead. Local markets proliferated with the autobiographies of youth, many not yet in their twenties. Hicks on the release of her second book, Discuss Disgust, which she viewed as the turning point in her transition from model to full-time writer. Note the book's cover art. Hicks was also a frequent contributor to Singaporean and regional press outlets. Her frankly-written bi-monthly column in The Straits Times, "The Bonny Hicks Diary", in which she often discussed her childhood on Sentosa Island, further incited traditionalists over feelings that Hicks was an improper role model for young, impressionable girls, whom they felt were being morally corrupted by Hicks. Yielding to public pressure spurred initially by a letter-writing campaign to the paper, the Times pulled her column after not even a year, even as the paper's widely esteemed editor, Lim Richard, voiced regret over what had clearly been a politically motivated decision by the paper. Pushing back as far as practicable, Lim began running frequent "special" columns by Hicks. Having taken an especial interest in Hicks' development as a writer since her first publication, Lim was uniquely authoritative when he noted the deepening of Hick's writings as she matured. At the time of Discuss Disgust's release, Hicks reported to the New Straits Times that she had been working on a third book, one that centered on a series of correspondence between herself and a female housemate, whom Hicks left unnamed. Hicks wrote of her social observations of the United States during a two-month visit, from which her housemate springboarded into social commentary about Singapore. While the book idea further reveals Hicks' preference to write with a certain person in mind, it never ultimately materialized, not even as a draft from private files. Hicks in 1990, as she made her transition from model to writer. I experienced great happiness and great sorrow in my life. While the great happiness was uplifting and renewing, the sorrow ate at me slowly, like a worm in the core of an apple. I realized then that stable happiness was not mine until I could eliminate the sorrow too. The sorrow which I experienced was often due to the fact that my own happiness came at a price. That price was someone else's happiness. Despite Hicks' confession that she had harmed others along her path to fame, and her intention to reverse the trend, she all along had her supporters—those who comprehended her on a level deeper than the mere fandom she had so often sought to instigate toward herself, and who saw in Hicks a young lady not trying to offend but to initiate critical conversations within a culture that was often far too resistant to anything beyond the familiar. To them, Hicks' anthropical philosophy of life that featured loving, caring and sharing was not only refreshing but important, perhaps more than even Hicks herself could see at the time. A growing voice appeared to emerge clearly in her writings, and it attracted many Singaporeans and others, including some scholars. Two of the scholars would become pivotally influential new mentors to Hicks during her major life transition, the ultimate result of which, as things would turn out, would be cut short by her untimely death. One of Hicks' new mentors was Tal Ben-Shahar, a positive psychologist and popular professor of psychology at the time at Harvard University. Hicks reached out to Ben-Shahar after being exposed to his writings, and the two corresponded about philosophical and spiritual matters for approximately one year, on up until Hicks' 1997 death. The correspondence later became basis for a 1998 book by Ben-Shahar, in which he narrated Hicks' profound growth during the year. Thinking is more than just conceiving ideas and drawing inferences; thinking is also reflection and contemplation. When we take embodied thinking rather than abstract reasoning as a goal for our mind, then we understand that thinking is a transformative act. The mind will not only deduce, speculate, and comprehend, but it will also awaken, will enlighten and inspire. Si, is how I have thought, and always will think. Tu asserts that Hicks' use of the Chinese character Si was "code language," readily understood by her Chinese-speaking English readers, to convey New Confucian thought. The piece, Hicks' last, reflects the maturing and deepening engagement in philosophy and spirituality that she had clearly been enveloped in under tutelage of her new mentors during her last year of life. When Hicks penned Excuse Me, are you a Model?, her intent was to write a first book to which people would react. Whether those reactions were positive or negative was not her young mind's first concern. Only public indifference, the antithesis of public reaction, would impede her achievement of fame and popularity, she believed, a message Pat Chan had certainly instilled in Hicks from the start. And to be sure, that was pragmatically so. Scant few found themselves able to respond to Hicks with a mere shrug, a fact that fueled not only her popularity but the controversy that so doggedly followed her. Yet Hicks' limited life experience could not have led her to anticipate the intensity of the negative reactions, could not have allowed her to surmise the toll that the negative words and societal shunning would take upon her psyche over time. In many ways, her move to Indonesia, which coincided with her plea for greater public understanding as released in her second book, Discuss Disgust, was an attempt to escape the intense controversy she had experienced in Singapore over her first book, Excuse Me, Are You a Model? Whether her departure was something of a victory for traditionalists, a mere admission to herself of her limited constitution to withstand societal disapprobation, an outcome of simply her own maturation, or some combination of the three, cannot be known. What is clear is that her hope through her move was to find a reprieve from the societal shunning she had been experiencing from traditionalists in Singapore; to move to a place where she could deepen and further redefine herself before, perhaps, undertaking a larger and much wiser relaunching of herself in Singapore, and as she clearly had hoped, internationally. Part of Hicks plan was to attend university. Although publicly downplaying its drawbacks, she privately expressed regret that she had not studied past her A-levels, a fact traditionalist critics had barbed against her and her writings with no small frequency. During the year leading up to her 1997 death, Hicks applied to numerous universities in Britain and the United States, including Harvard. She called upon her Harvard mentors to exert influence on her behalf during her application process, which certainly helped overcome any negative effects that remained from Hicks' unremarkable academic record during her youth. By the time she applied, Hicks could present herself as an exceptional candidate to any university she wished to attend. Here was a young woman who had overcome a very difficult upbringing to become a nationally known model-turned-author, and whose mind, spirit, and insights had authentically impressed the two high-level academicians who had become the predominant mentors of her life transition and letter of recommendation writers. Hicks soon reported through the Singapore press that she had received one university acceptance, refusing to say where, stating that she was awaiting other possible acceptances before ultimately deciding where to attend. Artist's depiction of the most probable crash incline of SilkAir Flight 185, just as it began breaking into pieces. Hicks had also thought to mature her image by marrying, settling down, and planning to have children. Shortly before her death, Hicks became engaged to her longtime boyfriend, Richard "Randy" Dalrymple, an American architect of some prominence because of his unique structures in Singapore and Jakarta, once featured in Architectural Digest. It was to celebrate Christmas with Dalrymple's family that Hicks and Dalrymple boarded SilkAir Flight 185 in Jakarta en route to the United States, probably their first visit as an engaged couple. 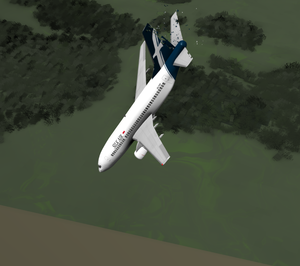 Less than thirty minutes into the flight, in a deliberately radical descent from 35,000 feet, SilkAir Flight 185 began a sudden high-speed nosedive at an almost direct incline toward the Musi River. The plane reached such high velocity that it broke into pieces in the air before scattering across the river surface. Local fisherman immediately scoured the crash site for survivors but did so in vain. Both Hicks and Dalrymple perished, along with all others aboard. Not a single body, not even so much as one complete limb, was found intact. Hicks' death at age twenty-nine shocked Singaporeans and others, and prompted a swirl of activity as people sought to interpret the meaning of a life that had been suddenly cut short. Meanwhile, investigators probed the crash of SilkAir Flight 185. No part of Hicks' body was ever found. Her wallet and credit cards, found by divers at the crash site, provided the final confirmation beyond the official passenger list of her demise. SilkAir Flight 185 had crashed with such tremendous force that only six of the one-hundred-and-four victims could be identified from the scant bodily remains left partially intact. As the crash investigations continued, investigators discovered that Hicks' ex-husband was a Republic of Singapore Air Force friend of Tsu Way Ming, the Singaporean captain of SilkAir Flight 185. According to the recovered flight recorder, Tsu had walked into the first-class area of the plane's cabin minutes before the crash, where it would have been hard for him to miss Hicks and Dalrymple seated together in first-class. While there, Tsu was thought to have disabled the plane's flight recorder to prevent it from making a clear record about the rest of what he was about to do. Investigators additionally discovered that Tsu had not only longstanding personal problems and a string of troubling incidents as a pilot, but leading up to the time of the crash, had been experiencing serious family and financial problems, in part due to gambling debts. Suggesting premeditation concerning his plan to crash the plane, Captain Tsu a month earlier had taken out a large life insurance policy on himself that went into effect just hours before the crash. As answers and unanswered questions continued to trickle out from the flight investigations, literary scholars both in Singapore and elsewhere began their own investigations: of Hicks' writings. Some did so anew, while others did so for the first time. Tu Wei-Ming characterized Hicks' life and philosophy as providing a "sharp contrast to Hobbes' cynic[al] view of human existence", and stated that Hicks was "the paradigmatic example of an autonomous, free-choosing individual who decided early on to construct a lifestyle congenial to her idiosyncratic sense of self-expression." More than anything, Tu said, "She was primarily a seeker of meaningful existence, a learner." Lim Richard, the editor of the The Straits Times, interpreted Hicks in a eulogy by recalling her life and contributions to the paper, and by publishing an excerpt of the famous essay "Whistling Of Birds" by D. H. Lawrence. Lim began his piece with a line from the famous folk/rock song Fire and Rain by James Taylor. "Sweet dreams and flying machines, and pieces on the ground," sung into his readers' memories in Taylor's highly somber tone, seemed to perfectly encapsulate much of the retrospective feeling across Singapore about Hicks' life and sudden death. On the first anniversary of Hicks' death, in December 1998, Tal Ben-Shahar published Heaven Can Wait: Conversations with Bonny Hicks, in which he weaved together his and Hicks' year-long correspondence with his own philosophical musings. The book is described as an extended postmodern "conversation" between two seekers intensely journeying together in a quest for meaning and purpose, and takes its title from an article Hicks submitted to The Straits Times just days before her death, which ever after took on a hauntingly prophetic air. In it she wrote, "The brevity of life on earth cannot be overemphasized. I cannot take for granted that time is on my side—because it is not ... Heaven can wait, but I cannot." In an earlier Strait Times piece that memorialized her grandmother, Hicks confessed that she believed in life after death. By this time, the crash investigations were complete. Indonesian authorities concluded that the crash had occurred for unknown reasons, resulting in nearly universal criticisms that they had politicized their report so as to not strike fear into potential passengers of its fledgling national airline industry. U.S. authorities, whose painstaking research had largely become the basis of the criticisms against Indonesia's findings, took a confidently different view. Employing uncharacteristic brushes of rhetorical force in their final report, they ruled the crash a suicide/homicide by deliberate action of the captain. As a result of Indonesia's findings, legally controlling per the life insurance policy, survivor benefits were paid in full to Captain Tsu Way Ming's wife and children. Yet per the almost universally accepted U.S. conclusions, Tsu had murdered Hicks, along with the one-hundred-and-three others aboard his plane. Both in life and death, Hicks' status as a writer came to eclipse her status as a model. Today she is most recognized for her contributions to Singaporean post-colonial literature that spoke out on subjects not normally broached, and the anthropic philosophy contained in her writings. Describing the consensus of Singaporean literary scholars in 1995, two years before Hicks' death, Ismail S. Talib in The Journal of Commonwealth Literature stated of Excuse me, are you a Model?, "We have come to realize in retrospect that Hicks’s autobiographical account of her life as a model was a significant milestone in Singapore’s literary and cultural history." This recognition preceded Hicks' death, and especially in light of the controversy and even societal shunning she early faced for her writings, surely took her and many of those around her by some surprise and helped fuel the life transition she underwent prior her death. Hicks is a transitional figure between old and new Singapore. Especially among Singaporean youth, who in the years since Hicks' death have become increasingly uncomfortable with their country's traditional backdrops of racialism, Hicks is also recognized today as a person who learned to cross cultural boundaries, who found a comfortable niche in the betwixt-and-between of contesting cultural traditions, and who lived as one who was race-blind to see people for who they really were. A memorial in honor of the victims of SilkAir Flight 185, including Hicks, stands beside the Musi River crash site in Indonesia. Another is at Choa Chu Kang Cemetery, Singapore. ↑ 1.0 1.1 1.2 1.3 Ismail S. Talib (95). "Singapore" (PDF). Journal of Commonwealth Literature 3 (35). A subscription is required to view the link. ↑ Divers battle muddy water at Indonesian crash site, World News, CNN. Retrieved on 2006-12-27. ↑ 3.0 3.1 3.2 3.3 3.4 3.5 3.6 3.7 3.8 3.9 Institute of Policy Studies (Singapore) (1991). "Yearly Publication". Times Academic Press for the Institute of Policy Studies. ↑ 4.00 4.01 4.02 4.03 4.04 4.05 4.06 4.07 4.08 4.09 4.10 4.11 4.12 Tu Wei-Ming (1998). Celebrating Bonny Hicks' Passion for Life. Harvard University. Archived from the original on 2005-11-21. Retrieved on 2006-12-27. ↑ Maureen, Koh. "Mum spends birthdays at crash site", The New Paper, 2008-08-26. ↑ 6.0 6.1 Grace Chia (1998). Mermaid Princess. The Literature, Culture, and Society of Singapore. Retrieved on 2006-12-27. ↑ 7.0 7.1 7.2 Tan Gim Ean, "A Bonny way to tell the truth" New Straits Times, 30 May 1992, 28. ↑ 8.0 8.1 8.2 8.3 Cover Girl from first to last. Life Section. The Straits Times (Singapore) (28 December 1997). Retrieved on 2006-12-29. ↑ 9.0 9.1 9.2 9.3 9.4 Rahman, Sheila, "Don't judge a covergirl by her looks," New Straits Times, 2 Sept 1990, 10. ↑ Majorie Chiew (May 27, 1992). Model Bonny opts for a change in scene. The Star (Malaysia). Archived from the original on 2006-10-06. Retrieved on 2006-12-29. ↑ 12.0 12.1 (5 September 2001) "SilkAir". The Los Angeles Times. Dalrymple's architecture in Singapore was featured in: Dalrymple, Richard. "Pavilions for a Forest Setting in Singapore." Architectural Digest (4/91), 48 (4). ↑ About Flame of the Forest Publishing. Flame of the Forest Publishers (2006). Retrieved on 2006-12-27. ↑ 14.0 14.1 Poddar, Prem; Johnson, David (2005). A Historical Companion To Postcolonial Thought In English. Columbia University Press. ISBN 0-231-13506-8. ↑ Interview and review by Koh, Buck Song, "Little girl lost", The Straits Times 21 March 1992. ↑ Tan Gim Ean, "That's why mummy is a tart" New Straits Times, 30 May 1992, 28. ↑ 17.0 17.1 Hicks, Bonny (1992). Discuss Disgust. Angsana Books. ISBN 981-00-3506-3. ↑ 18.0 18.1 18.2 Eugene Benson & L.W. Conolly, eds. ; Wei Li, Ng (1994). Encyclopedia of post-colonial literatures in English. London: Routledge, 656–657. ISBN 0-415-27885-6. ↑ 19.0 19.1 Ben-Shahar, Tal (1998). Heaven can Wait: Conversations with Bonny Hicks. Singapore: Times Books International. ISBN 981-204-991-6. ↑ See for example the April 1991 and November 1993 issues. ↑ Dalrymple's architecture in Singapore was featured in: Dalrymple, Richard. "Pavilions for a Forest Setting in Singapore." Architectural Digest (4/91), 48 (4). ↑ See, for example, an essay by The Straits Times columnist Koh, Buck Song, "Bonny, you must wear a mini", 12 January 1998. ↑ 24.0 24.1 24.2 24.3 Peng Hui Tan, Keng Poh Wee, and Peter Sahelangi (October 2007). "Remembering the Musi – SilkAir Flight MI 185 Crash Victim Identification". Annals Academy of Medicine 36 (10): 861. Retrieved on 4 October 2013. ↑ Chia, Grace (1998). Womango. Singapore: Rank Books. ISBN 981-04-0583-9. ↑ Geoff Spencer (21 December 1997). "Most passengers still strapped in their seats". Associated Press. ↑ U.S. authorities investigate crashes that occur on foreign soil whenever Americans were aboard the plane. ↑ Families of SilkAir MI185 Association - Memorial Dedication Ceremony Speech. Home.pacific.net.sg. Retrieved on 2010-07-16. This article is derived principally from "Bonny Hicks" by Stephen Ewen, which is licensed under the Creative Common Attribution-Share Alike 3.0 Unported and later. Attribution on face of article is required. This page was last modified 05:07, 4 October 2013.